This tour combines activities in the desert of Paracas National Reserve and Huacahina with a journey towards little Andean villages in the highlands of Lima. We will practice sand boarding at the giant dunes of Huacachina, discover Paracas National Reserve and sail to the Ballesta Islands before heading towards Lima’s highlands. We will have a whitewater rafting experience in the Cañete River and be amazed by cascades, waterfalls, lagoons and find picturesque farm towns nestling among the mountains. If you love nature, this program fits perfectly for you! This morning, we have an early departure in our private car along the Pan-American Highway heading to the valley of Ica located 300km south of Lima and surrounded by the endless sand dunes of the Ica desert. Ica is well know for its warm and dry climate which is perfect for growing vines, so, when approaching Ica, we’ll make a short stop for a guided tour through an historical vineyard where our famous Pisco liquor are made. Afterwards, we’ll have lunch (not included) at a traditional restaurant, where we’ll enjoy some delicious Afro-Peruvian dishes. We then leave for the natural lagoon of Huacachina, known as the Oasis of America. From this beautiful landscape we go into the desert aboard powerful sand buggies feeling all their speed and adrenaline. We practice sandboarding and test our skills in this sand sport. After observing the sunset from the vastness of the desert we go back to Huacachina and relax in our charming hotel. Early rise as we prepare for our 1-hour drive to Paracas bay. On arrival, we’ll board the fully equipped speedboats departing from the Libertador Pier towards the Ballesta Islands, also known as the little Galapagos because of the great variety of marine wildlife the inhabited them. En route, our boat stops to observe the “The Chandelier”, an enigmatic figure that can only be seen from the sea. We’ll go through caves and rock formations that have been carved by the sea and wind over time. Once we’re back again on dry land we’ll drive to the Paracas Reserve, one of Peru’s most important Natural Reserves. First, we’ll visit the parks visitor center and then walk along a trail t see Parihuanas (flamingos). After we’ll drive to some cliff top lookouts from where we’ll be able to admire the immensity of the ocean and beautiful beaches. We have lunch (not included) in the tiny fishing village of “Lagunillas” and then we have a two hour drive to Lunahuana a small town located in the beautiful Cañete Valley, where we´ll spent the night. Services: Private Transport / Ballesta Islands in Shared Service. This morning, after breakfast, we prepare to go on a white-water rafting experience in the Cañete River with the security of having the best professional guides and the right equipment for this activity. For lunch (not included), we recommend trying the local specialty, freshwater shrimp. After this, we leave Lunahuana heading towards the little Andean village of Huancaya located at 3550 m.a.s.l. We’ll be travelling uphill along the beautiful Cañete Valley for about 3 hours. On route we’ll see the crystal clear Pikicocha lagoon where we stop to enjoy the scenery and surrounding mountains. From this point onwards the river slows down forming many lakes and waterfalls, this is one of the most beautiful areas in all of Peru. We then pass by Vitis, a small village located on top of a mountain and only a few minutes later we reach Huancaya, our final destination for today. This afternoon, there will still be some time to relax and explore the town with its narrow cobbled stone streets, colonial bridges over waterfalls and friendly local people that will greet us. In the evening, we are welcomed in a family house where we will spend the night. Accommodation: Family homestay with basic shared facilities. Private rooms and a shared bathroom (warm water isn’t always available). Today we’ll enjoy an easy hike from Huancaya heading to the beautiful Carhuayno falls. The trekking route runs through a small path where we can appreciate the waterfalls and a variety of migrant birds. We also see local people performing their daily agricultural activities. If we are in good shape, we can choose to continue from Carhuayno to Hualhua where we can paddle in the lagoon to reach the falls of the same name. We walk in the natural surroundings where the awesome rock formations carved by the Cañete River over the years. This is an excellent spot to take landscape photographs. Afterwards, we return to Huancaya. At night, we light a fire and enjoy some of the local myths and legends. After breakfast, we leave Huancaya and head for Vilca village. Along the route we enjoy the breathtaking view of green lakes, waterfalls and beautiful turquoise lagoons such as Carhuayno, Huallhua among many others. In Vilca we walk through a bridle path for about 1 hour to reach the spectacular Papacocha waterfall. 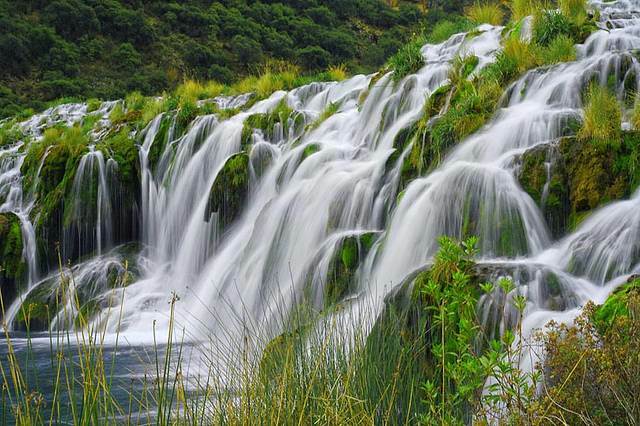 We arrive in the place known by local as “Love Forest Cascades” where a wide variety of fauna and flora can be seen. We drive back on the same dirt road to Huancaya where we have a typical lunch. Finally we drive back to Lima arriving at your hotel around 7 o 8pm. All transfers in private vehicles.